Very Special Thanks go to the author, Mr. Haltiner, who so graciously gave permission to publish photographs and excerpts from his book. As a beginner searching in the Alpena, Michigan area, I found this book a great asset in helping me to picture life as it was in the early years. This book would be a great investment for anyone searching for their ancestors in Alpena. I obviously cannot put the entire book on this page, but the book can be purchased from THE GIFT GALLERY at the JESSE BESSER MUSEUM for $14.95, plus shipping and handling. THE GIFT GALLERY can be reached at (517) 354-7742. Due to limited space, I am presenting this information in a different order than is presented in the book. But, please remember that all photographs and excerpts are taken directly from Mr. Haltiner's book. Little is known about this area before the first permanent white settlers arrived in 1856. The area was visited occasionally by fishermen, traders, surveyors and hunters. The only permanent residents were small groups of Indians headed by Chiefs Mich-e-ke-wis and Sah-gon-ah-ka-to. The first whites were not welcomed and soon left after encountering unfriendly Indians and hostile environment. Nevertheless, slowly but surely, encroachments were made. 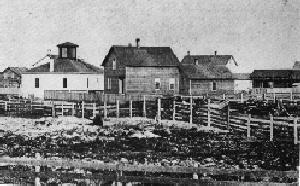 Alpena County and the present city site had been visited in 1834 by Mr. John DOUSEMAN and others from Mackinac who had attempted to settle here and build a saw mill but were driven away by the Indians. Jonathan BURTCH visited here in 1836 but moved to Ossineke because of hostile Indians. W.F. CULLINGS, a fisherman and trapper, was in the area about the same time. David D. OLIVER came briefly in 1839 with a party of surveyors. Sometime before 1840 a lighthouse was built on Thunder Bay Island with Jesse MUNSEY as the first keeper. A party of hunters had built a few rough log shanties near the mouth of the Thunder Bay River and occupied them for several months during this early time. Mr. O.S. WARNER cam briefly about 1840 to trade with the Indians, And during the summer of 1840 Mr. Thomas TURK landed at Alpena and Stayed over during a storm -- sleeping on the north side of the river on the spot where was once an Indian burying grounds. In the fall of 1844, Washington JAY, his wife and daughter, and a mane named William DAGGET moved from Thunder Bay Island to what now is Alpena. .......... Mrs. Jay and her daughter, Emma, though not the first permanent white settlers here, were in all probability the first white women to visit the area. land in this vicinity. ........... George N. FLETCHER and John S. MINOR also located lands here at an early day. George N. FLETCHER and James K. LOCKWOOD were the original proprietors of the site of Alpena. In 1855, having secured pine lands in this vicinity, they purchased 450 acres of land lying on both sides of Thunder Bay River and bordering on Thunder Bay. They made the purchase of Erastus BAILEY and Robert DUNLAP of Chicago for $15.00 an acre. Mr. FLETCHER retained his one-half interest and Mr. LOCKWOOD sold one-eighth interest each to Mr. John OLDFIELD and Mr. John S. MINOR. ...................And on November 26, 1856, Daniel CARTER, his wife Sarah and daughter Mary, arrived and became Alpena's first permanent white settlers. 1857 - First store constructed -- The Miller, Fletcher & Co. First post office established as Fremont, Michigan. 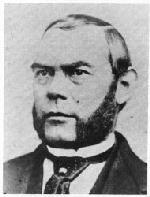 Daniel CARTER was thhe first postmaster, being appointed December 2, 1857. 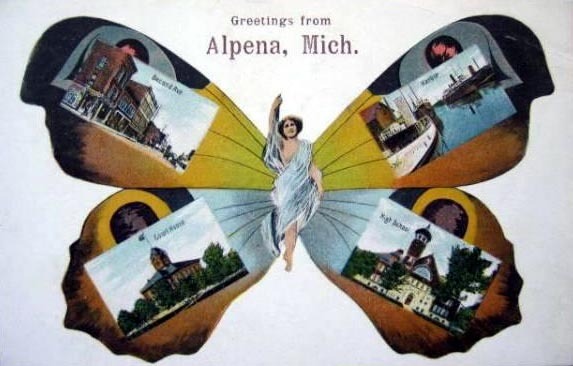 1859 - The name Fremont was changed to Alpena. Smith & Chamberlin built the first steam sawmill in Alpena. July 22 - Birth of James A. BOGGS -- first white child born in Alpena City. 1863 - First school built. First Court House erected .... May 1 - First newspaper issued -- "The Thunderbay Monitor". 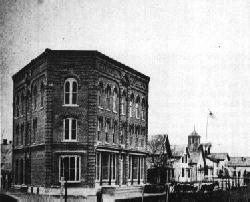 1872 - March 1 - Bank of Alpena Banking Company opened. 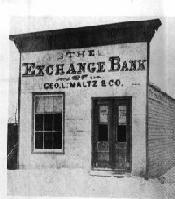 April 1 - Maltz Exchange Bank commenced banking business. July 12 -- Worst fire in Alpena's history, 15 acres of stores, businesses and residences burned in the heart of town. September - Office of the Weather Bureau established. 1873 - Wooden swing bridge completed. Smallpox epidemic. 1874 - Census of the years shows 1,000 more men than women in the county. The building to the right, with a tower, was the old Trinity Episcopal Church built in 1867. 1877 - Lighthouse at mouth of river erected. 1879 - June 18 - First telephone line constructed in Alpena. In 1880 Alpena was almost 25 years old -- almost "over the hill" as lumber towns went. Hedr lumber production would peak in 1889 and the end of her lucrative life was in sight. But something happened to Alpena in the decade of the 80s. The little north woods town suddenly grew up and decided to live beyond the lumber which had given her first life. alpena truly became "the town that wouldn't die." The population of 6,000 in 1880 would mushroom to 9,000 by 1884 and surpass 10,000 by the decade's end. Mills would number 17 -- 12 lumber and 5 shingle -- during most of the '80s. That progress brought to alpena modern marvels far earlier than to many larger cities (excerpts from the book follow). Other industries would appear in the 1880s as, one by one, the lumber mills closed. Tanneries, a woolen mill, a spool manufacturer all helped to keep the town's economy solvent. There were by 1887 seven neighborhood schools, two Catholic schools and Cnetral High on Second Avenue. Churches included three Catholic and two Lutheran, plus the Congregational, Baptist, Methodist, Episcopal and Presbyterian. Entertainment in Alpena at the time centered around the fabulous, newly refurbished Maltz Opera House, later the State Theater on North Second Avenue. But crowds also gathered at the Culligan or Arbieter Halls or the Temple Theater. A roller rink, a huge toboggan slide and the best trotter race track in the state further contributed to the citizens' good times, as did the many saloons. The decade of the '80s was when the infamous Blinkie Morgan, Ohio robber-kuiller, was captured by alpena's Sheriff Charles Lynch, who was mortally wounded by the outlaw. And it was the time a character named George Jacob Schwienfurth convinced many in Alpena that he was Christ's reincarnation. He had acquired a church and a sizable fund of money before being exposed as a fraud. June 21 - Stone foundation - Lockwood School completed. Lots of construction - homes, etc, throughout the year. November - First numbering of houses and businesses. New Stone Jail opens. Beck Brewery built. Blinkie Morgan Gang - 1887 Charles (Blinkie) Morgan is the man in the center photo. Some said he rode with the James Boys. True or not, the infamous Blinke Morgan was wanted in many parts of the country. Ohio offered a big reward for his capture after he bludgeoned to death a Cleveland policeman. 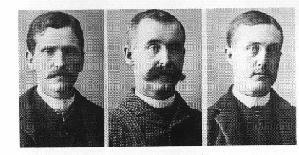 Blinkie Morgan and his henchmen, Coughlin and Robinson, wre captured in their Alpena hideout by Sheriff Charles Lynch on June 27, 1887. During the fracas, Lynch was mortally wounded and died of blood poisoning August 17th.